Energy and the embracing of great innovation drive the team at Blunt Architects. Their careful attention to detail and workmanship is seen through all their projects. 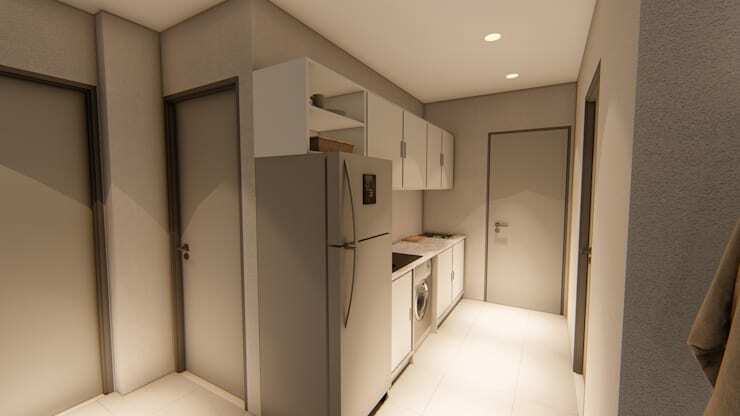 That being said, they offer superb designs for commercial and residential buildings. 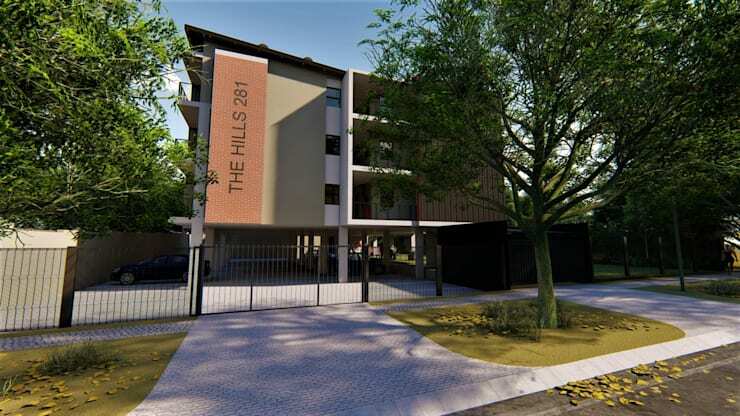 This is a perfect example of their work right here in Hatfield with this unique block of flats called 'The Hills 281' boasting 21 units, parking bays and outdoor entertainment areas. If you’re looking for great architects and professionals that specialise in all your home improvement, design and construction needs, then homify is the place to be. Let’s explore The Hills 281 in this post! 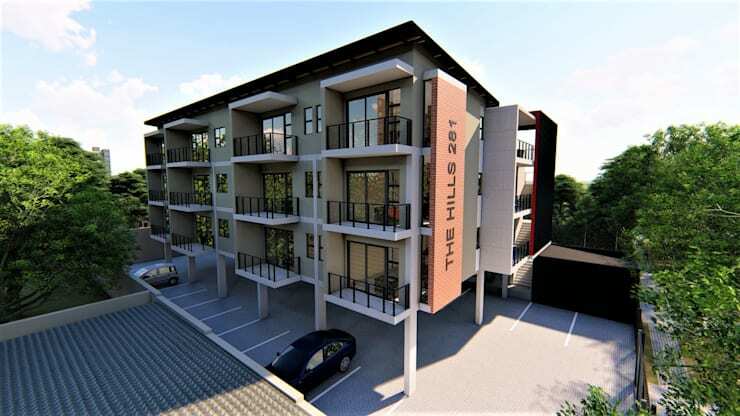 This is a street view of The Hills 281, boasting its remarkable contemporary architecture design. Mixed materials such as red face brick and plastered walls on the exterior give it the low maintenance quality whilst still showcasing a modern feel you get when looking at it from the outside. Each apartment enjoys elevated viewing with spacious balconies that can accommodate some outdoor furniture where suited. 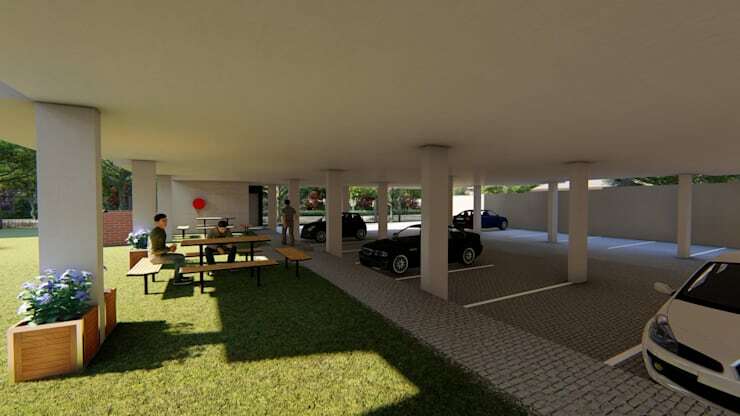 The back area is great for entertaining guests with extra braai areas and a lush green garden lawn for kids to play whilst being in the safe confines of the property. 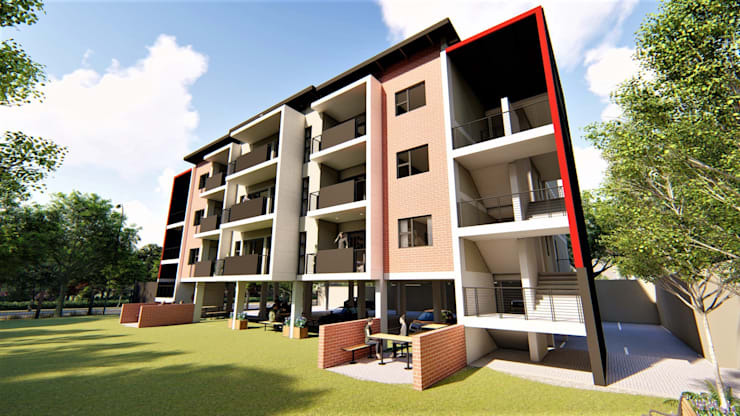 Contrasting paintwork as seen in the exteriors of the building creates a beautiful blend adding to the tasteful creativity that went into this modern apartment building in Pretoria. 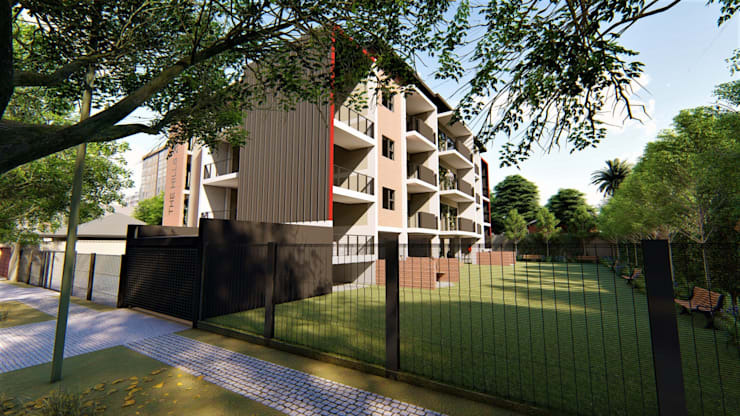 With some apartments having the selection of two balconies, it gives these residents options for alfresco dining on either side of the flat. These balconies are overlooking the parking lot and can enjoy sun and shade throughout the day. The Hills 281 is simply a delightful and stylish apartment building no matter which side or angle you’re viewing it from. 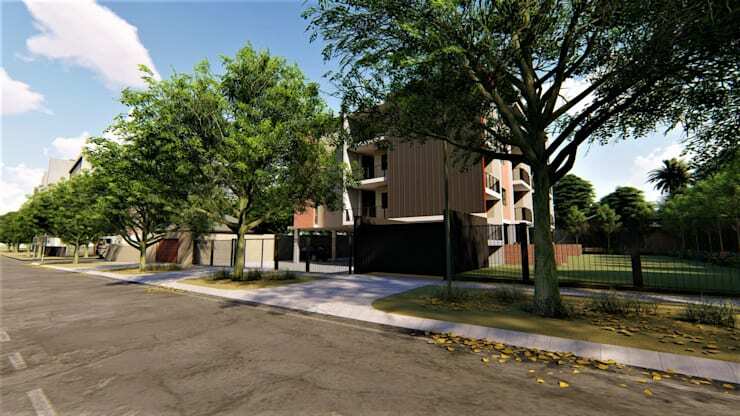 The driveway entrance to the block of flats embraces the beauty of nature featuring trees and lawn on the outside and inside of the property. These units also showcase lovely functional kitchenettes that give you just the right amount of space to whip up a meal whilst having guests over to join. It is spacious and features enough storage. The master bedroom enjoys the easy access to its very own private balcony, perfect for taking in the fresh air early in the morning. On top of that, the room is not lacking in space and you can truly go about customising your room to suit your style. 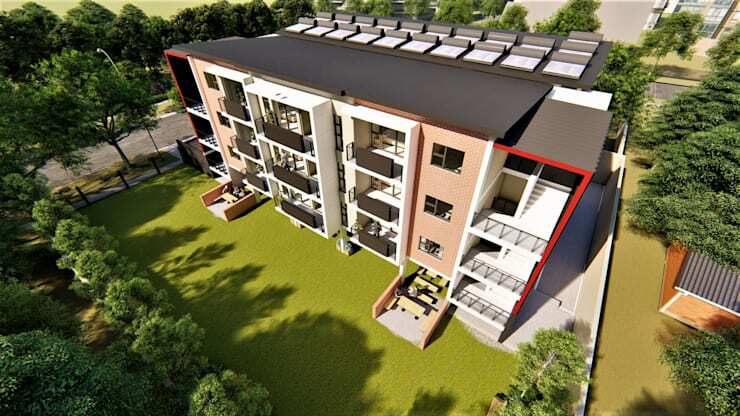 With even more space to entertain guests outside, these apartments feature extra seating close to the braai areas and parking bays. Needless to say, The Hills 281 is not short of innovation and functionality that people can truly enjoy. If you’re designing your home, here are 5 modern houses with floor plans that will inspire you! Are you ready to get the help of trusted professional architects to help you design your home?